Away from the hustle and bustle of the shopping area of Wellington yet still close to the waterfront (about a block back from Te Papa) this Japanese restaurant is great very child friendly and is open for lunch and dinner. 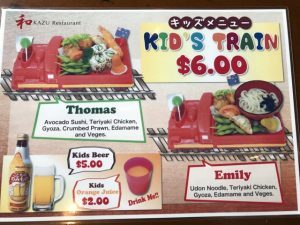 With a dedicated kids’ menu offering 2 ‘train plates’, each allows kids to sample a selection of food available on the main menu. 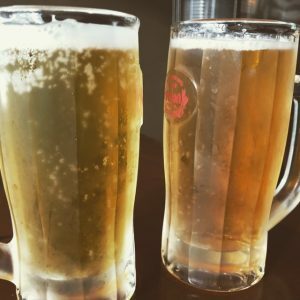 Kids love the idea of ordering a ‘beer’ (fizzy apple juice), served with an ice cold glass and froth that stays – just like a real beer! These train plates arrive at the table with the waiting staff blowing a whistle so make a real entrance. The regular lunch menu gives a choice of bento boxes or noodles. The dinner menu has a great selection of dishes as well and kids might prefer to order from there. The small plates make a good starter or sharing meal. From cooked at the table hotpot to sashimi, noodles and dumplings there should be something for everyone. The seating options are either regular tables or traditional Tatami style of low chairs and table. Open: for Tuesday – Sunday for lunch 11.30am – 3pm and dinner 5pm – 10.30pm (last order 30mins before closing). Closed Monday and Public Holidays.